On 10 November, Misrata local security forces arrested two individuals connected to the Ajdabiya Revolutionaries Shura Council. On 4 November, the Anti-ISIS Operations Room claimed to have arrested a member of the Benghazi Revolutionaries Shura Council. Libyan National Army’s RADA Central Deterrent Forces arrested two suspected terrorists in Ajdabiya. On 14 September, a terrorist attack was reported to have occurred targeting the Zliten Security Directorate. The ISIS Amaq news agency claimed responsibility for the 25 October, attack on the ‘Tisan’ checkpoint south of Ajdabiya, which killed at least 3 LNA fighters and left another two injured. Survivors report that the assailants arrived in 7 vehicles and set the entire checkpoint on fire after seizing the LNA’s firearms. It was reported that on 29 October, ISIS fighters established a temporary checkpoint on the coastal highway 20km east of Sirte. The area in question is considered to be under the control of al-Bunyan al-Marsus (BM) forces aligned with the GNA. On 18 August, Abdulkader Jumaa Abdul-Hadi Afnish Al-Zwai, a senior leader and founding member of the Benghazi Defence Brigades (BDB) and the AROR, died following a raid on his home in Misrata. On 13 August, the Libyan National Army’s 101 Infantry Brigade clashed with Derna Protection Forces remnants near Gate 200 on the Tubruk-Ajdabiya highway. On 11 August, the Libyan National Army conducted airstrikes from its al-Jufra airbase targeting Benghazi Defence Brigade (BDB) forces located near al-Saddadah. On 28 July, several vehicles belonging to ISIS fighters were observed south of Uqaylah moving to the 103 line towards the Kufra and Jalu region. 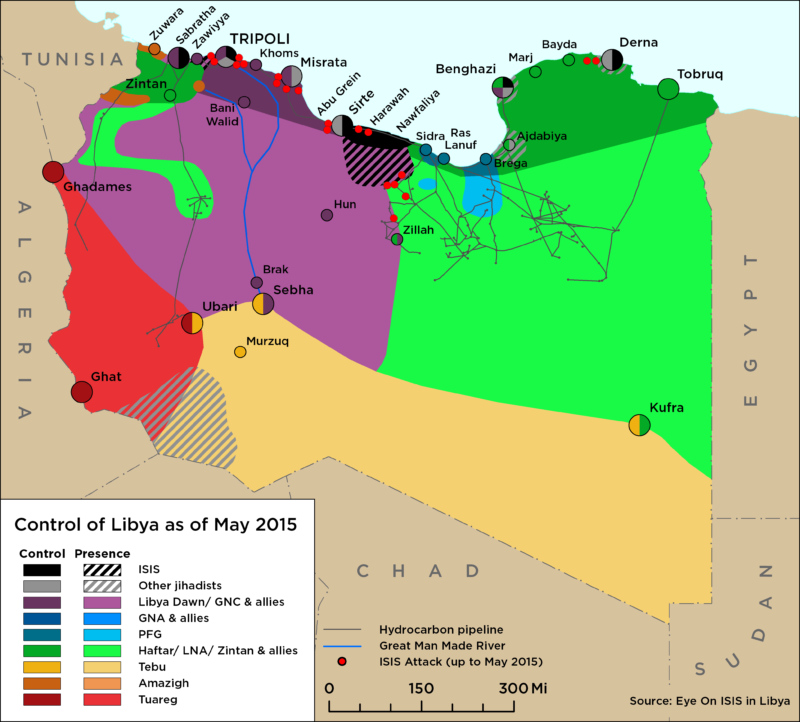 Additional details have emerged surround ISIS’s attack on the police station in Uqaylah in Eastern Libya on July 24. On 23 May, ISIS claimed responsibility for the two attacks that occurred in the Oil Crescent on May 22 – a suicide vehicle-borne improved explosive device (SVBIED) targeted the Libyan National Army (LNA) 152 Brigade Gate 60, south east of Ajdabiya, while gunmen attacked an LNA checkpoint north of Awjilah kidnapping two guards. 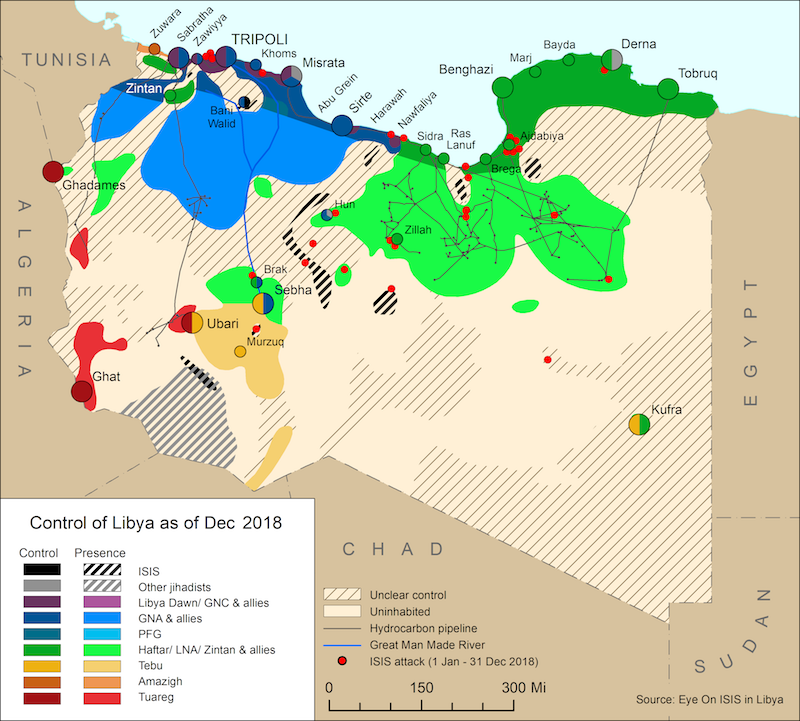 On 24 March, the LNA aligned Salafist ‘Arrest and Investigation Units’ of Benghazi and Ajdabiya were disbanded with their respective members re-integrated into the Internal Security Organisations in their respective cities. On 23 March, the Tarik Ben Zeyad brigade, who are one of the two most powerful Salafist brigades aligned to the LNA, deployed to southern Libya.